Weather-ready Staywax canvas is manufactured to be extremely water-resistant and cut-resistant, yet breathable and light. It uses a unique blend of wax and polymers to give it legendary durability without feeling oily. Unlike traditional wax cotton finishes, Staywax doesn’t transfer to clothes or skin. Machine washable. 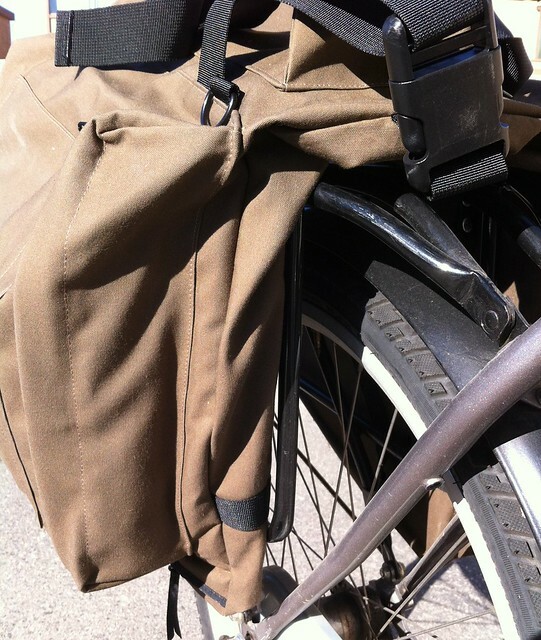 Wrinkle Free All the function of a travel suit bag on the back of your bike. Transfer hangers from your closet to inside your bag. Hangs vertical for convenient changing and packing. Easy Rack Mounting Mounting brackets (J-Clips) on the bottom of the pannier work with most standard bike racks. 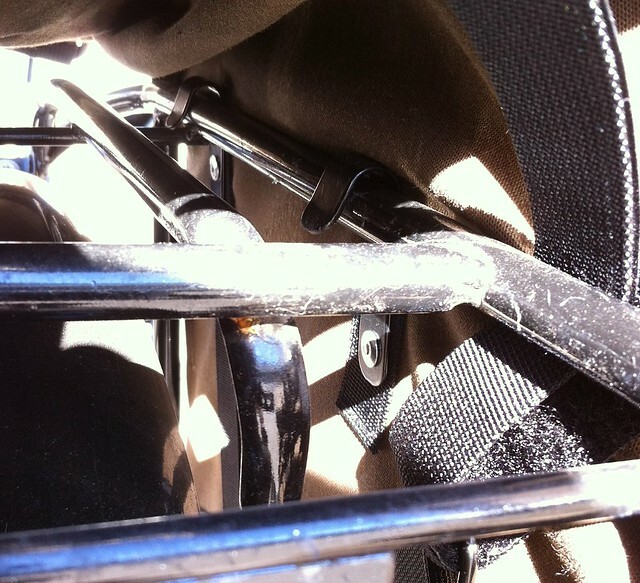 D-Rings hook over the rack’s bottom post and nylon velcro straps securely fasten the pannier to the rack. Built for a long long ride and will not bounce off. The bag has two side pockets. Interestingly, one is upright, while the other side is horizontal. You’ll also notice that it has a shoulder strap and handles to make it easier to transport. 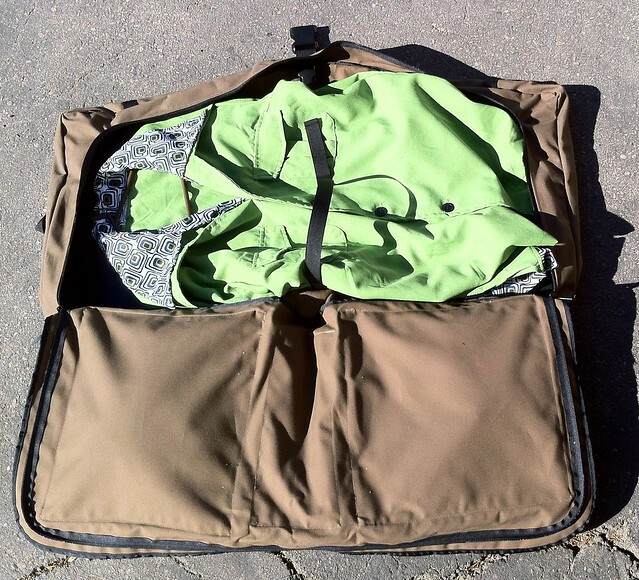 The bag works pretty much like any other bag with the exception of holding your suit inside. The side pockets can also carry a laptop; on the top of the bag there is a small zippered compartment where you can place your toiletries, belt, or whatever you want to store in there. Mounting the bag onto my rack was a breeze. The J-hooks fit perfectly and to secure the bag from falling off, the D-rings are attached to Velcro straps. So all I had to do was place the ring on the mount of the rack, cinch the strap and I was on the road! Here are the J-hooks and the Velcro strap. It’s a great fit, nice and snug. This bag isn’t going anywhere! 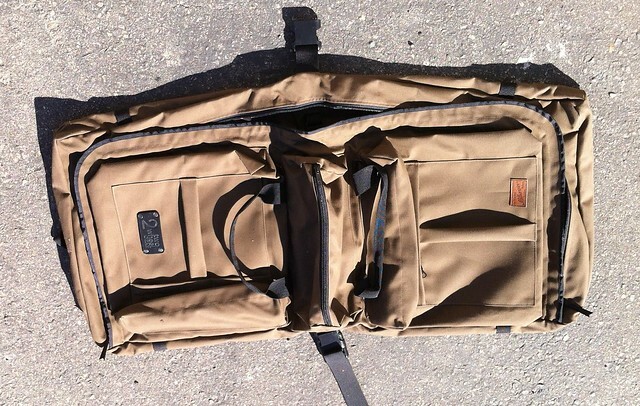 So let’s get down to the nitty-gritty of the Southwest Canvas bag. I simply LOVE this bag for its classy stylings and easy to use features. The zippers glide easily without catching any material. By the way, you know those water photos above? Well I checked the contents of the bag after getting it wet and they were completely dry! Another feature that I liked about the bag is that once you get to your destination, you can hang the bag on a door hook and you can start changing. But one thing about this bag that stands out to me from all the other bags I’ve reviewed would be the “grown up” look of it. I feel that I’ve out grown the whole messenger bag thing. I do like backpacks, but my back always gets sweaty. Not to mention my shoulders start to ache after a long ride. So with the Southwest, I arrive with a dry-ish back, the bag looks so good that an executive could confidently walk into his/her office with it and have it pair very well with their office attire. The Southwest is priced at $279 CAD or $247 USD. Sounds pricey? Well you have to keep in mind that most garment bags out there use nylon fabric and that material easily frays or tears. The waxed canvas used for the Southwest is weather resistant and designed not to tear. 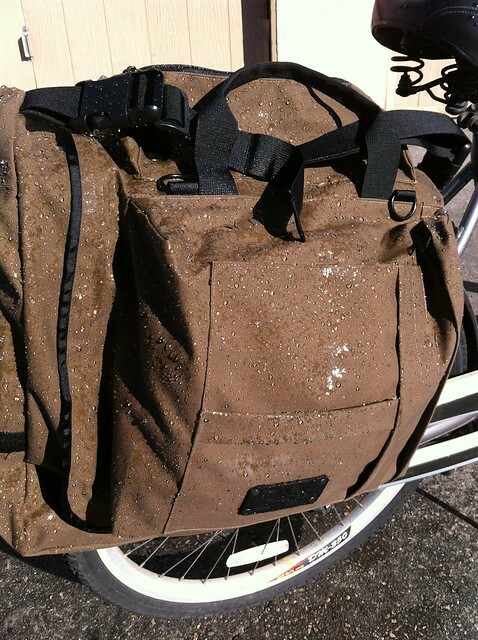 In addition to the high quality canvas, they also made all the straps and hardware with military grade materials. Now you know when people say “military grade” that it means it’s going to last a long time. 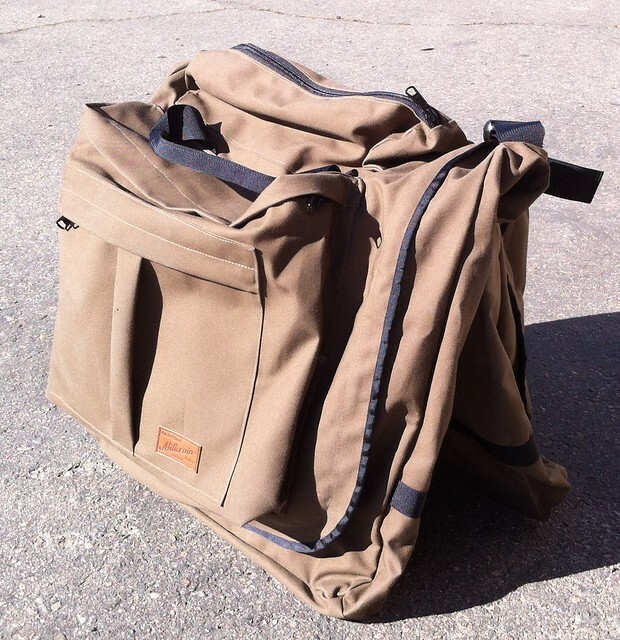 I’ve been using this bag for the last few months and it actually bothered the guys at 2 Wheel Gear that I wasn’t publishing a review so quickly, that’s only because I wanted to really get some time with it. I’ve even used this bag on my motorcycle to carry my clothes. 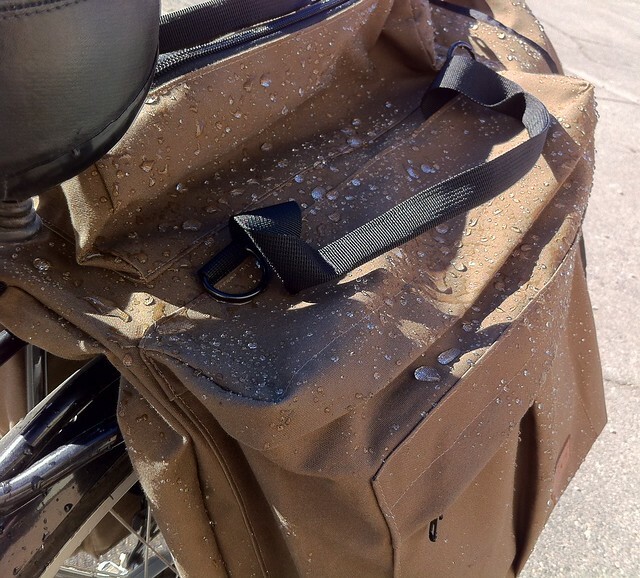 Even at 80 MPH, the bag held up well. I never experienced any type of craftsmanship issue, none of the zippers or other hardware broke or gave me problems. Oh, here’s another great thing about the Southwest, it’s completely machine washable! Yep, you can was this thing in cold water and let it air dry. The waxed canvas isn’t going to lose its characteristics — in fact, you’ll gain more character in the appearance of the bag. 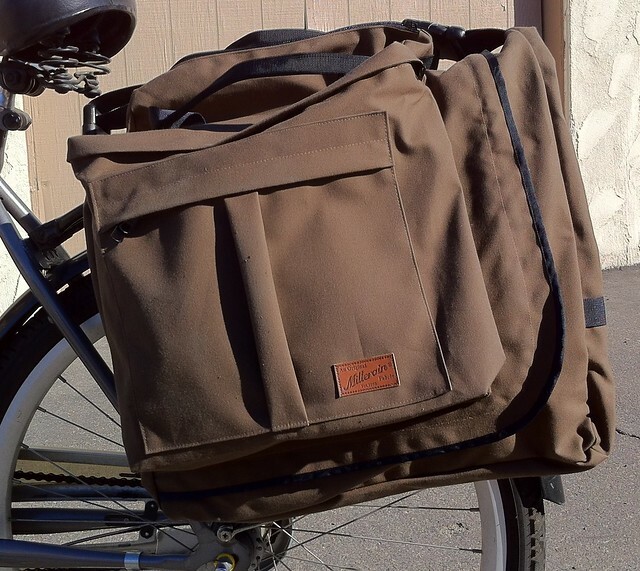 All in all, I was really pleased with the Southwest waxed canvas bag by 2 Wheel Gear. I like that they also design and manufacture all their products in Vancouver, BC and Calgary, AB, Canada. To me that’s great because they’re helping their local economy grow. The bag also comes with a 2 year warranty against manufacturer defects or craftsmanship issues. That’s a fine-looking bag. (And good photos – I can almost smell the canvas! A favorite smell, because I grew up in the Canvas Era – tents, tarps, awnings – things that are very fond memories.) It’s probably a bit heavier than an equivalent nylon bag, and that’s a big deal to the gear-heads who will pay $400 for a set of titanium skewers to shave 5 grams off their rolling weight. I’m anxiously awaiting a review of that hi-viz LEISURE SUIT, and where to buy it! Please hurry – I’ve got some Christmas parties coming up quick!! I like the looks of this bag. It seems well made. I like the fact that you can use your own full size hangers and there is pockets and room for a pair of shoes and your other necessities. My only concern is the water resistance and how often does the manufacture suggest you should re-wax the bag or would you ever need too? We have torrential downpours here in Florida. So bad that sometimes I think it would be better for me to get my paddle out and float my bike home. Other than the price I like it. Actually I think you’re right the price is not so bad when you look at the cheaper alternatives for a garment bag for the bike. It’s the 2WG team checking out some of your feedback and comments. Thought we’d also respond to Idaho Spud and JohnnyK’s great questions. on the weight side, the Southwest tips the scales at 67oz’s (4.2lb)vs our nylon cordura alternative at 64oz (4lb). 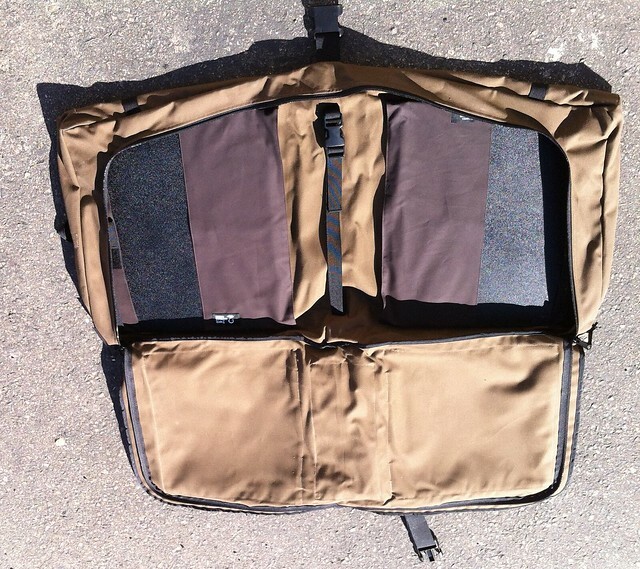 It’s just like carrying two separate pannier.We also designed it be a great travel bag for planes, trains and automobiles so it complies with most airline carry on requirements and weighs about the same as traditional travel garment bags. Water-resistance. This was a big one for us. Re-waxing is fine and all, but we know most people will “forget” to actually do it. This is where this particular waxed canvas from the Millerain Company comes in. We choose their Staywax cavas as it requires no retreating and is machine washable. We’ve been riding for over a year up here in Vancouver, Canada (where we get more then our fair share of rain!) 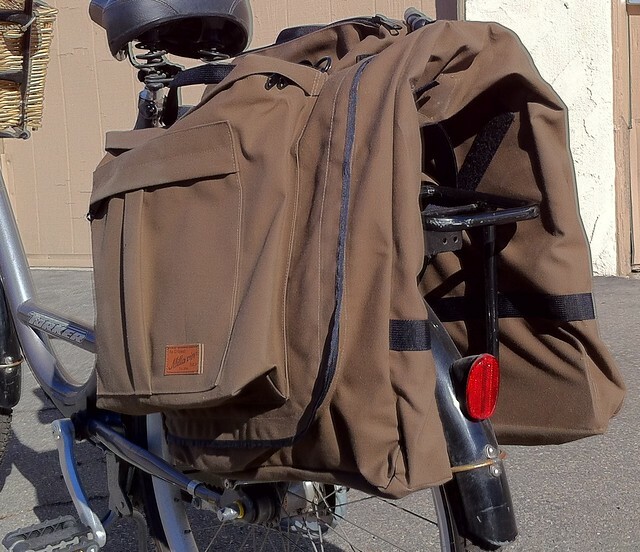 and both our Southwest Pannier and Heath Messenger Bags are still going strong. fire away with anymore questions and we’ll answer them asap.